Weight capacity is 600 lbs. Accomodates rise of 1 1/4" to 1 3/4". Constructed of extruded, anodized aluminum that will not rust or corrode. The EZ-Access Threshold Ramp is a lightweight yet durable modular ramp designed for doorways, sliding glass doors and raised landings. 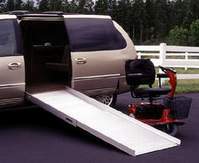 Threshold ramps may be used either one by itself or two combined to make entry and exit convenient and safe. 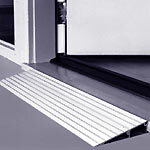 For sliding doors, two ramps is almost always necessary, one inside and one outside. Designed for manual and/or power wheelchairs. 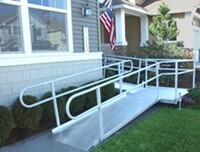 Two telescopic channel ramps each extend to be used on steps, vans, or curbs. For storage, simply pick up each rail and depress the guide buttons to collapse. For scooters and all wheelchair types. Designed to bridge the gap over steps, curbs, and raised landings. The ROLLUP offers a full-width driving surface that is lightweight and durable. Designed for maximum portability, the patented hinge design makes the ROLLUP convenient to store and set-up. The SUITCASE® Advantage Series ramp, with its single fold design, offers a simple and convenient solution for wheelchairs and scooters to access steps, vehicles, and raised landings with ease. This ultra-strong ramp provides the safety and strength required while remaining light and portable. The ramp can be separated, making it even easier to use, carry, and store. By simply removing two hinge pins, the SUITCASE Advantage Series ramp quickly separates into two lightweight sections, each with their own carrying handle. Ramp features high-quality skid-resistant tape with yellow safety strips and a self-adjusting bottom transition plate for easy conversion from ramp to ground. Unfolds to a 29” wide platform. Manufactured of welded aircraft-grade aluminum. Features an 800 pound weight capacity and three-year limited warranty. The multi-purpose ramp designed for scooters and all wheelchair types. The PLATFORM 8 makes mini and full-size vans accessible, while also acting as a semi-permanent ramp. 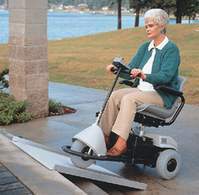 Extending from 4 1/2- to 8-feet in length, the 30-inch wide ramp provides a safe and solid driving surface. 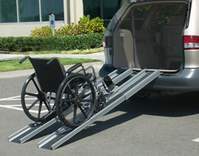 Features two platform sections that connect to create one telescoping section that slides easily and allows the ramp to be used at various lengths. Made of anodized aluminum and features a durable non-skid driving surface.